From Shane: My greatest challenge as a writer stems from the fact that I love to write massive stories, but struggle with the countless tiny details of flushing out something great. Shortly after moving back to Canada from Haiti, I reconnected with an old friend, Darryl Frayne. I knew Darryl was just about the complete opposite of me, in that he loves to mine the gems found beneath the extra words that don't belong on the page. He works down in the weeds, pruning and clipping and shredding and planting and changing the paths as required to develop great story. The magic that unfolded was...well, I suppose you can be the judge. In The Maidstone Chronicles Book One: Across the Fourwinds by Shane Trusz and Darryl Frayne, readers are introduced to Will Owens, a teenager with a strange gift of seeing dark creatures emerging from the Arden Forest, which is near his house at #25 Nineteenth Avenue where his parents once lived. He first starts noticing these creatures after his mother’s death and he tries searching the internet to identify these humanoid creatures. He names them Lessers and, just like the mystery of the Lessers, his dreams also baffle him. People in the town of Cochrane avoid him and think he is a lunatic, especially after his stint at the psychiatric facility in North Bay. Ostracized by everyone, Will Owens has become a recluse, but he finds a friend in Morgan Finley. 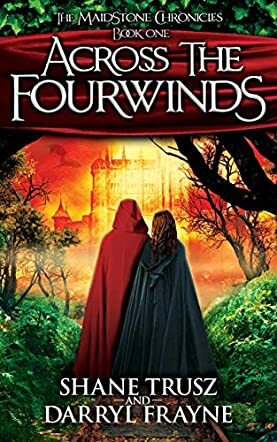 Together they venture into the Arden Forest where they enter the magical realm of the Fourwinds to discover that an evil in the Maidstone Tower is threatening to destroy not only Fourwinds, but also the town of Cochrane! It is a compelling story of friendship, courage, and faith and will keep readers glued to the pages until the very end. The authors weave a story of mystery and fantasy with memorable scenes and characters that will remain etched in the memories of readers. Be it Callum Sage, Will Owens, Morgan Finley, Bremer, or the Lessers; every character in the story is strong and they complement the plot nicely. The elements of darkness, mystery and curiosity that linger in the plot as the story progresses make it an entertaining read. The detailed descriptions make the story vivid and I cannot wait to read Book Two!